Kit has lost her mother. She was the only person Kit had in the whole world, she was the focus of everything and it was always them against the world. With this tragedy still very much in her mind, Kit suddenly decides that she wants to find out more about where her mother came from and more importantly who her father was or is. This sudden need to hold onto something and ground Kit has brought her to the island of Elba and The Thousand Light Hotel, so-called because of a local legend which is celebrated in the year. It is this which gives Kit, a travel writer the opportunity to actually have a valid reason to be there and not to be just looking for something she has lost. I was transported to Elba, to the beautiful hotel, the intense heat and warmth of the sun. The sea as it was calm in the morning as Kit went to break the surface, to wake herself up, to find what she was looking for. Even down to food and the welcome that hotel gives. It was liking reading a holiday brochure but one with depth, feeling and so much of a back story. That is the beauty of the author’s writing, you are immediately transported to wherever she chooses to take you and she weaves a story that I knew was going to capture me just as the heat of the island itself. This is a book which is gentle, meandering if you will, in the heat of the day as you cool off in the pool, enjoy aperitif before dinner and beautiful fresh food to round your lazy day off. However it delivered some unforeseen twists and turns which is why I kept reading the novel, I knew that this could not possibly be the end of the story for Kit. A lovely read which transports you and also one that made me go and read more about a place. If there was ever a book that seriously made me want to go and visit a place, this was it. Interestingly enough, I have covered very little about the plot in this review. I think that is because you need to know that Kit goes to Elba, to find out about her father, if I say any more I feel that the prior knowledge you have will impact your actually enjoyment of the book. Like an unknown destination when you go on holiday, I think this is a book where you need to discover as you turn the page with nothing to influence you. 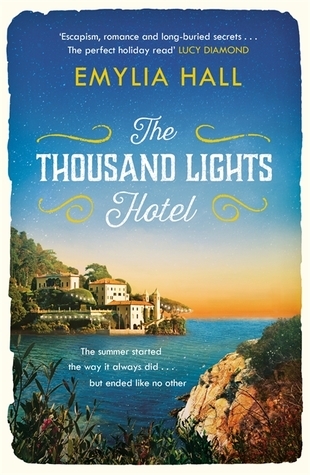 A Thousand Lights Hotel is out now on e-book and 13 July in paperback.